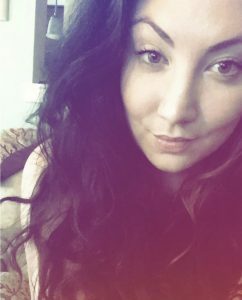 It’s been a decent summer so far, I’m still little by little organizing and cleaning the house since getting back from vacation, but, it’s been a veryrelaxing week! I’m super excited to be doing a Fab Five today, since I haven’t in so long! Don’t forget, share any of your current favorited with me, in the comments below! I did a post, last winter, on the Kat Von D ‘Lock-It’ concealer, powder, and brushes, which can be found here. This week while on vacation I stopped and thought, wow I really use this brush every single day & I don’t even use it the way I’m supposed to! I use this powder brush as my foundation brush, and I find it does a great job at applying my foundation evenly and without any creases or blotches. I also use it with the Kat Von D Lock-It Setting Powder, but I’m just obsessed with using it for my foundation. If you’re looking to try a new brush, that can be multipurpose, and is amazing all around, I highly advise checking this one out! Londontown sent me an awesome press package, and the first color I decided to wear was Cheerio, a perfect peachy color for summer! If you’re unfamiliar with the Londontown brand, I’ll be featuring a full post about the brand on Monday, so stay tuned! I just had to share my current polish with you all, because I’m seriously obsessed with this color! My current living room candle, I love the apple magnolia blend. It’s so light and makes the room smell like beautiful flowers. I’m a huge Voluspa fan, I love all of their scents, & it’s a coconut wax for a more clean burn. These little tin candles last for about 50 hours too which is awesome! The past few years have been all about the seed & grain life for health. Whether it’s chia seeds or hemp seeds, we’ve all seen tons of recipes on how to incorporate these omega-3’s into our diets. I love this blend option from Trader Joe’s that incorporates all of the seeds like hemp, chia, red quinoa, buckwheat, flax, and more. Yes, I know it’s been around for years, but I just discovered it!! They have like no taste, just a great crunch, so I add it to my avocado toast, salads, and in different sauces I make. It’s a great way to get a healthy dose of omega-3 fatty acids, protein, & fiber. You can find this at any Trader Joe’s! 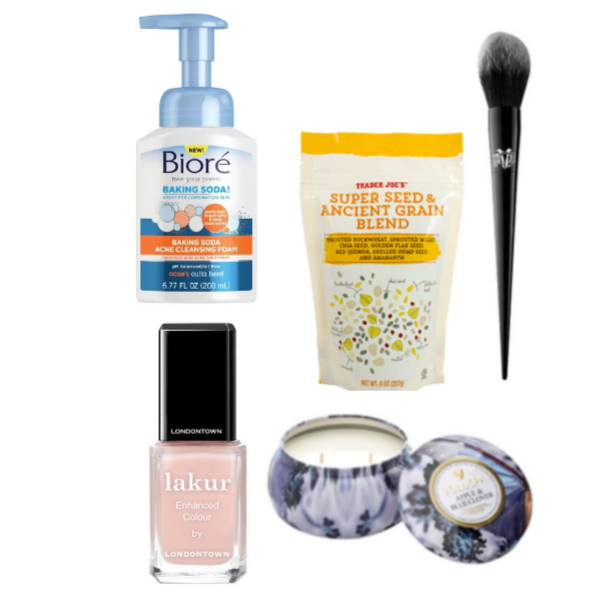 If you missed my Budget Beauty post on Monday, here’s a quick recap…I love the Biore Baking Soda Cleansing Foam! You can read all about why, here, but really, I can’t stress enough how great this product is for oily skin during the summer. It’s almost Friday, be happy! !